As you age, there are many experiences you can leave in the past. Regular visits to the dentist is not one of them. Geriatrics health includes professional oral care. Dry mouth is a common problem for seniors. While it can develop naturally, it can be worse if you take certain medications. The discomfort and bad breath are bothersome, but dry mouth can also lead to dental issues. You may have old dental work that needs to be repaired or replaced. One example is a filling. A routine visit is a time to bring these issues to your dentist’s attention. If you have retained your natural teeth, home dental care and visits to the dentist can prevent tooth loss and gum disease. If you are missing a tooth, an implant can keep your other teeth healthy and improve your appearance. Cosmetic dentistry can improve your teeth, too. Aging, diet, and oral hygiene practices can cause teeth to become dull, stained, or discolored. When you want the brightest smile, you can ask your dentist about teeth whitening. Denture-wearers need to visit the dentist, too. Even if your dentures are in perfect condition, they may need to be replaced. They may not fit as well as they did in the past, and may not be as effective. Loose dentures can be uncomfortable, and eating can be difficult. A simple exam can help your dentist know if you need new dentures. 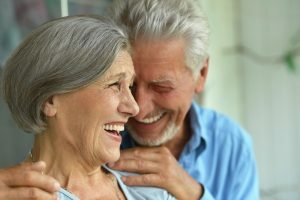 Whether you have a full set of natural teeth, dental work, or dentures, geriatrics health includes home oral care and visiting the dentist on a regular basis. You can decrease your risk of serious oral health problems, and have better general health during your older years. You do not have to leave oral health behind as you age.